MARCH promotes informal discussion and collaborative programs for faculty, professionals, and students in public history, museum studies, and historic preservation in southeastern Pennsylvania, South Jersey, and Delaware. The annual Public History Community Forum (PubComm), co-sponsored by MARCH, provides graduate students with conference planning experience and networking opportunities and has been featured in Public History News. As host for the co-editor’s office of The Public Historian, the leading journal in the field, MARCH is a point of connection to national and international networks of public historians and public history educators. 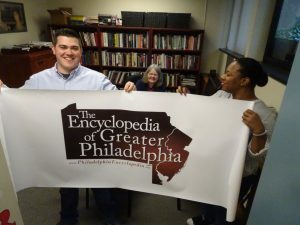 MARCH is the institutional home for The Encyclopedia of Greater Philadelphia, a digital-first research and civic engagement project to build knowledge and understanding of the history and impact of Philadelphia and the surrounding region. Through this project, MARCH facilitates a network of more than 30 partner organizations, more than 300 scholars, and students and young professionals who gain experience in historical research, writing, and digital publishing. MARCH advocates stewardship of the Cooper Street Historic District in Camden as a model outdoor classroom and asset for the campus and adjacent communities. Research into the social history of the district is creating new knowledge about Camden residents during the city’s period of greatest growth. With this, we gain insights into patterns of investment and disinvestment during the nineteenth and twentieth centuries. Students contributing to this project gain research and writing skills and insight into urban history, historic preservation, and historical interpretation. Public History Boot Camp is a training initiative offering low-cost, high-quality workshops on current scholarship and essential skills for public history professionals. Initiated in 2013, our boot camp programs have been featured in Public History News and at national professional conferences. In 2017-18, we added regularly scheduled group viewings of webinars open to the campus and professional communities. MARCH provides a collegial campus setting for individuals or small groups pursuing independent projects in public humanities, including but not limited to public and urban history, heritage tourism, and projects focusing on Philadelphia/South Jersey and the Mid-Atlantic region. In our home community of Camden, New Jersey, MARCH has supported and developed programs fostering appreciation of the life and work of Walt Whitman, who lived in Camden during his final years, 1884 to 1892. MARCH encourages understanding and engaged stewardship of the Mid-Atlantic’s shared heritage as a region of industry, including the challenges of transition to the post-industrial economy. Past projects included interpretive planning for the Bethlehem Steel works site in Bethlehem, Pennsylvania. MARCH advocated for civic engagement and interpretation of both slavery and the presidency at the site of George Washington’s presidential residence, which stood in close proximity to today’s Liberty Bell Center in Independence National Historical Park. MARCH provided logistical support for noted photographer Camilo José Vergara’s work to document the transformation of urban landscapes, particularly the creation of the Invincible Cities website hosted by Rutgers-Camden. Each year from 1999 through 2015, MARCH presented the annual Fredric M. Miller Memorial Lecture on public history, honoring the achievements and legacy of a leader in the archives profession and in public humanities.